The flexible and inexpensive DocLogix Machine Maintenance solution was created to help effectively manage everyday activities related to industrial machines by reducing the time and effort needed for planning and performing these activities. This solution covers many different types of machinery maintenance, such as breakdown maintenance, preventive maintenance, time-based maintenance, periodic maintenance, condition monitoring, and others. Analyse information and data in order to optimise all the aspects of the machinery maintenance. Also, the DocLogix system projects and traces the details of all maintenance activities and can provide information how to optimally schedule (not too rarely but also not too frequently) inspections and maintenance actions for certain groups of machines working in different conditions. Manufacturing companies who are tired of losing money, materials, time and clients, because of spending too much time on machinery maintenance, who can’t afford the downtime, and who must plan all the activities that are related to their machinery maintenance ahead of time can all benefit from this solution. Reduced amounts of machinery failures – equipment problems will be detected and will receive maintenance before they turn into expensive issues. Creation of a standardised maintenance procedure – the people responsible for the maintenance will be in sync with the situation at all times. 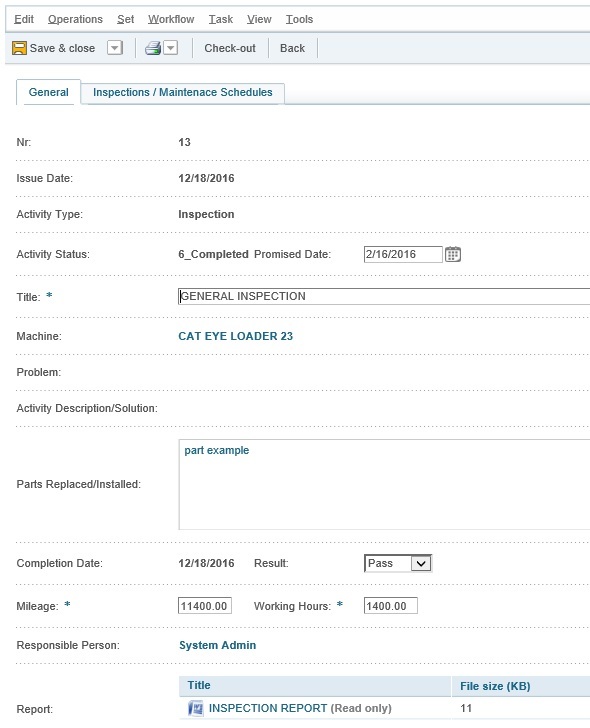 Ensures that every required inspection is planned and performed on time – the system lets you create a maintenance schedule for the machines, equipment, groups of equipment, and others. All of the data can be arranged into different categories: schedule type, frequency, or time of the last inspection. Increased average time between failures (MBTF) and better efficiency of the equipment. Increased operational time and lifecycle of machines – you will be able to gather and analyse all of the necessary information about the equipment’s durability and performance. Increased efficiency of maintenance actions – maintenance managers will have more information to enable better planning of their maintenance related activities. Shortened time for service and maintenance actions and repairs – the system will ensure that regular inspections are performed on time. Identification of recurring equipment problems in order to correct all the causes – in the system you will be able to see the relationships between the maintenance requests and the reports of problems. Effective and convenient planning of preventive machine maintenance. Prioritisation of machine/equipment maintenance actions. Easy access to information – histories of inspections, overviews of the costs related to maintenance, maintenance reports, predictions of the next inspections, scheduled inspections, etc. Cost savings in the maintenance area – the system will help to avoid production interruptions, as well as extensive and expensive machinery downtimes and expensive repair services, by ensuring that you plan and perform every required inspection. Improved safety in the factory. Instant searches including all metadata and text type content of the related documents. Possibility to store and/or relate and access any other file or/and DocLogix document from the machine card. Efficient management of the relationship between the main asset and its sub-components, modules and parts. The system doesn’t limit the quantity of nested levels, and lets the user easily extract all the sublevels in the relationship tree. Dynamic tracing of the status of maintenance, depending on whether the maintenance action is planned or performed. Creation of the maintenance report (maintenance order) on the basis of an already registered maintenance request. 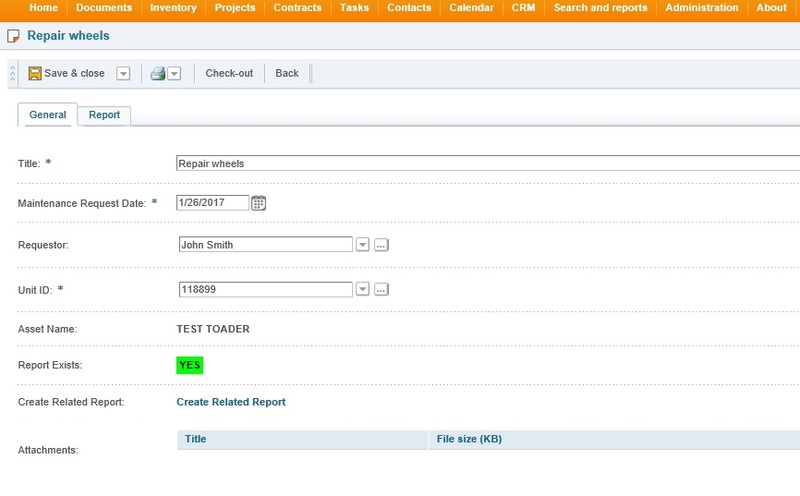 Production of the content for maintenance reports (to be filled out manually in the field) after assigning the metadata including the relationship with the machine. Sending email notifications to the person responsible for performing the maintenance. The users can assign single task assignments to each other along with the expected delivery dates. The system will send preventive notifications, as well as corrective ones in the case of a threat or delay. Records of the machine’s working hours, as well as the maintenance actions and their costs. User can easily extract and calculate the overall cost of maintenance actions or the quantity of working hours in a particular period. Maintenance schedules can be assigned for classes (groups) of machines – there is a possibility to create an individual group for a certain type of machine. Continuous calendar time periods, mileage increases or machine working hour increases. The system predicts the date of the next required mileage/working hours reading for the machine. The user can easily extract the list of the machines included in an inspection. The system supports a simple inventory management solution for the machinery parts that are used for the inspections and maintenance actions. The DocLogix Work Orders and Workflow Management solution can be integrated with any operational system, including accounting or specific ERP processes.